St. John’s Conservatory Theater announces their fifth full season of all original musical comedies to be presented at the multi-million-dollar all-digital George Hall Auditorium, Ogdensburg Free Academy in Ogdensburg, NY. Next year’s 2018 opener is the return of their very popular review The New Variety Radio Show scheduled to open in late Spring. A tribute to the golden age of radio, this all-singing, all-dancing, all-comedy spectacular is hosted by a comedian ala Jack Benny named Waldo Fern, and his sidekick Mr. Wilson. He’s joined in his glamorous WKNY art deco studio by the multi-talented St. Lawrence Darlings (think Mickey Mouse Club), which perform sketches, song and dance accompanied by the Max Weaver Orchestra. The New Variety Radio Show boasts lavish production numbers of popular hits of the 20’s and 30’s. Patriotic tunes such as Give My Regards to Broadway and I’m a Yankee Doodle Dandy are showcased along with jazzy showstoppers such as Chicago, That Toddlin’ Town and Second-Hand Rose. Toe-tapping hits to gut-busting jokes to tap-dancing thrills collide with a fast-paced radio program reminiscent of the famous radio variety shows of the 1940s. Their musical comedy adaptation of Oliver Twist simply titled Twist, with book, music, and lyrics by award-winning writer and composer Richard O’Donnell penned under his nom de plume B. R. Kreep, is a lavish production filled with eye-popping sets and costumes, catchy tunes, and soulful ballads. Opening in the Summer, Twist spotlights orphan Oliver Twist, born in a workhouse and eventually sold into an apprenticeship with an evil undertaker and his family. Oliver finally escapes into the night and travels to London, where he meets Nancy, a caring barmaid and “The Artful Dodger,” a member of a gang of young pickpockets led by the comical criminal, Fagin. Making their first appearance in last year’s hit Kreepy Hollow, the spooky kooky Hobb sisters return in their very own musical titled The Horrible Hobb Sisters opening in the fall. A tribute to famous TV shows such as The Munsters and The Addams Family, The Horrible Hobb Sisters showcases a mausoleums worth of characters such as Willard Hobb and his wife Mayhem, aunt Minerva and uncle Myron Nightshade, the sister’s ghostly nanny Parthenia and a whole stable of eclectic cousins and friends. 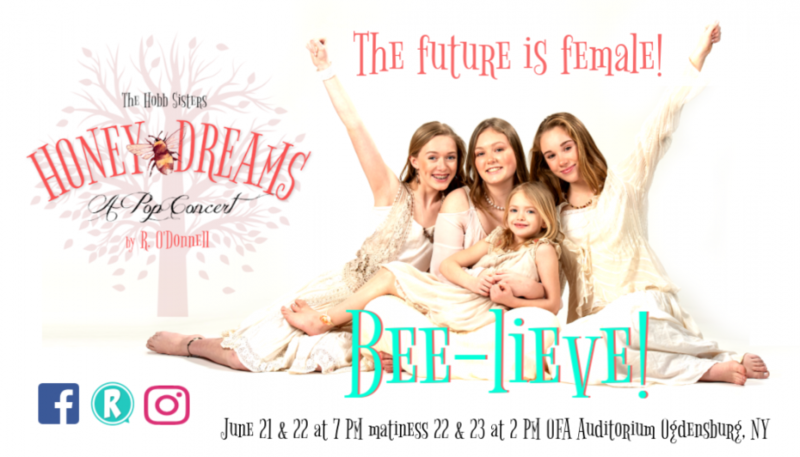 Reprising their roles as the creepy sisters are Macy Murdock as Alia Hobb, Ava Rutherford as Ravinia Hobb, Caroline Silver as Etta Hobb, and Grace Brunet as Tabitha Hobb. Dealing with adolescent issues such as bullying, first love, and imaginary friends, the sisters Hobb confront each obstacle with dazzling show tunes and poignant ballads. Penned by B. R. Kreep as a perfect treat for Halloween, The Horrible Hobb Sisters is a costume party for the entire family. As a matter of fact, come dressed as your favorite Hobb character and you’ll be rewarded with a half-price admission to the show. Closing out their fifth season, Mr. Scrooge returns in this comical and touching local holiday tradition. Dickens’ A Christmas Carol, presented like an elaborate Carol Burnet sketch, contains full-scale production numbers, moving ballads, and lots of improvisation and audience participation. Mr. Scrooge takes place in a riverport Victorian town in 1843, Ye Ole St. Lawrence, where a miserly Ebenezer Scrooge (played by O’Donnell), “Bah Humbugs” the Christmas spirit to the dismay of his family and friends. Spirits and phantoms from his past, present, and future appear dancing and singing while attempting to scare some sense into the ill-tempered miser. Along with a visit from Santa Claus and his elf Sugarplum, Mr. Scrooge is a “must-see” for the Christmas holiday season. St. John’s Conservatory Theater principal creative staff includes Producing Artistic Director Mr. O’Donnell, Musical Director and Choreographer Angela Conzone Dwyer, Digital Orchestrator and Vocal Arranger OFA graduate Ryan C. McNally, Scenic and Prop Designer Stephen Chambers, Costume and Makeup Designer Karen Fischbeck, Senior Costumer Heron Hetzler, Technical Director and Production Coordinator Christopher Dwyer, Sound Designer Richard Patton, Lighting Designer Barry Pratt, and Props Master Tonya Ott. Collectively they have over five decades of professional theatrical and academic experience including regional, stock, bus and truck, off-off-Broadway, off-Broadway, and Broadway stages. All productions will open at the OFA George Hall Auditorium in Ogdensburg, NY. Show times are Friday and Saturday evenings at 7 PM, with matinees Saturday and Sunday at 2 PM. Tickets cost $15 at the door (suggested donation), or $10 at brownpapertickets.com. This entry was posted in in the news and tagged comedy, musical, Ogdensburg, poster, theatre. Bookmark the permalink.